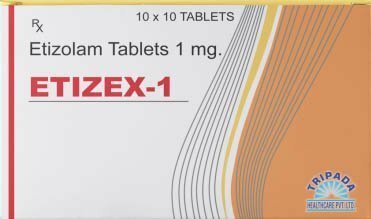 Etizolam is a fast acting synthetic substance belonging to a chemical class of thienodiazepine, and is known to produce anti-anxiety, disinhibition, muscle relaxation and sedative effects that are similar to benzodiazepine. 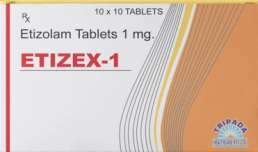 The etizolam has been reported to act as a full agonist at a benzodiazepine receptor site where it exhibits a range of therapeutic and adverse effects. The pharmacological activity is produced by virtue of the thienodiazepines bonding to a benzodiazepine receptor site, where it is reported to significantly enhance the efficiency and effects of the neurotransmitter gamma amino butyric acid (GABA) by acting on their receptors. 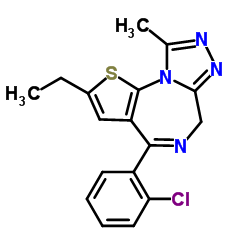 This receptor is the most abundantly occurring inhibitory receptor set present inside brain; therefore its modulation consequently produces sedating/ calming effect of etizolam on the nervous system. It has been demonstrated to be effective for a range of conditions, from insomnia and nervous irritation to anxiety and panic attacks. Its powerful anxiolytic, hypnotic and amnesic properties are complemented by a relaxing impact on skeletal muscles, which makes Etizex (generic Etizolam produced by Tripada) a suitable choice for facilitating a better psychophysical balance and eliminating consequences of accumulated stress. Etizex is controlled and manufactured within a strict cGMP certified pharmaceutical laboratory. Each blister pack contains 10 pellets, with every pellet containing exactly 1mg of pure Etizolam powder. Etizex has a rapid action mechanism, with full concentration reached after little more than 30 minutes and half-life estimated to 3.5 h.
Etizolam in the treatment of generalized anxiety disorder: a controlled clinical trial. Single and multiple dose pharmacokinetics of etizolam in healthy subjects. Etizolam versus placebo in the treatment of panic disorder with agoraphobia: a double-blind study.